The AAU Athletics program offers opportunities for athletes of all ages, in all skill levels to compete in Cross Country, Indoor Track & Field, and Outdoor Track & Field. Events are held throughout the country, including district championships, regional qualifiers, and National Championships. *For Nationals qualifying information, refer to the AAU Athletics handbook. The AAU Athletics program provides an avenue of competition for many ages as well as both genders. 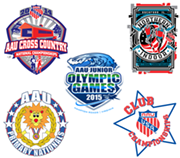 For more specific details on age divisions please visit the website www.aauathletics.org. *Athletes who are still eighteen (18) years of age through the final day of the National Track & Field Meet shall be eligible to compete in the 17-18 year olds division. **For Cross Country Age Divisions, refer to the AAU Athletics handbook. AAU 14U Youth National Champ.